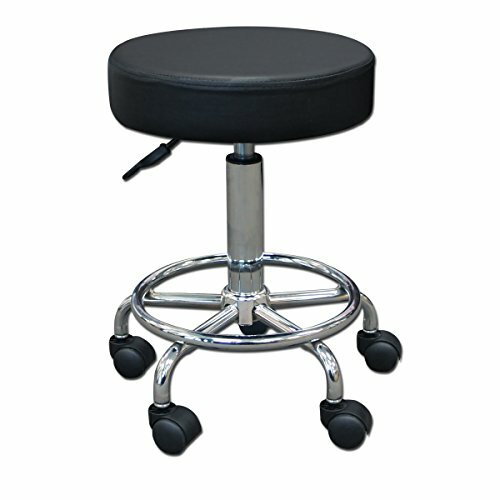 These durable, comfortable stools have a soft vinyl upholstery, and hydraulic adjustable height. Great for professional use and is also a great choice for home or school. The counter stool features a swivel mechanism and a hand lever for easy height adjustment. Combining a molded high density polymer seat with a sleek finish of the base, it is sure to complement virtually any decor. The rugged construction and pneumatic controls are designed for years of service. Disclaimer 1: when using this office stool on carpets, it is recommended to use an office chair mat. Disclaimer 2: during installation, please remove the black cap from the hydraulic stand for correct placement into the seat. Standard features: adjustable height- 5 smooth glide rolling wheels- rotates 360 degrees in both directions- firm grip hand lever. Includes: 4 screws and 1 Allen wrench, specifications: height range: 20 inch to 26 inch, seat diameter: 14inch, seat cushion thickness: 3inch, hand lever length: 6 inch, wheel size: 2 inch, wheel to wheel diameter: 17 inch, foot rest to floor height: 6 inch. Hydraulic gas lift makes height adjustment as simple as the pull of a lever. If you have any questions about this product by TOA Supply, contact us by completing and submitting the form below. If you are looking for a specif part number, please include it with your message. Squatty Potty Ghost Acrylic Toilet Stool, 7"